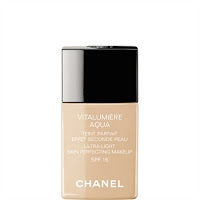 I received some Chanel Perfection Lumière in the post a couple of weeks ago and in order to accurately trial it, I decided to wear it every other day, with one of my other Chanel foundations in between each wear, as a reminder and a comparison base. 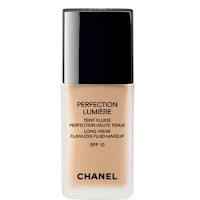 As long as I was wearing, and comparing, and making notes on all these Chanel foundations, I thought I'd blog on them. 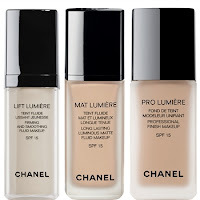 Rather than having a long long post, I'm going to split it into two, this one is a quick description of all the Chanel foundations I have and use, the other post will describe my Perfection Lumière trial in more detail. My love affair with Chanel foundations began about six years ago. I was embarking on the eternal quest for (a) a new signature foundation and (b) my wedding makeup foundation. I started using Chanel Vitalumière after some research and at the time it was, I thought (as a non-makeup-pro back then) a groundbreaking foundation. It wasn't thick or heavy, cloying or clogging. It gave a beautiful coverage, with a beautiful sheen. The colour was exactly perfect for me, with a yellow enough base to counteract high colouring. I really buffed the foundation into my skin to make it last on the day. I loved my makeup on my big day and got a lot of compliments. I'll always have fond memories of Vitalumière, but me, my skin and I have had to move on from this foundation. At the time of my wedding, I had younger skin, and moving forward a couple of years, I started to find my skin was glowing a bit more with a Vitalumière base than was strictly desirable... that beautiful subtle healthy sheen was starting to look more shine than sheen. So, on the advice of a Chanel SA, I switched to Pro Lumière. "Just like Aqua Lumière but not quite as shiny" was what I was promised. While I loved the formulation and finish, I was disappointed with the colours; the Pro Lumière undertones were always just that little bit pinker and just didn't suit me. I dabbled a little with Mat Lumière and Lift Lumière but they weren't what I wanted - a slightly "glowy" foundation, but not as glowy on my skin as Vitalumière; like Pro Lumière essentially, but in the right undertone. Pro Lumière and Mat Lumière are now discontinued, so I won't discuss here. Another few years later, and we see the introduction of Vitalumière Aqua to the Chanel foundation line-up. This is like the grown-up version of Vitalumière for slightly less youthful skins needing that sheen (not shine), that glow (not grease). Aside from the fact that you really get an upper body workout shaking the foundation before each use, I love this foundation. It wakes up your skin and makes you look more radiant. 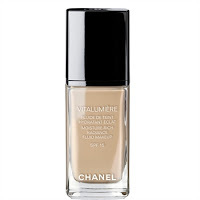 It's at most a medium coverage foundation, but it can be used summer or winter to give a dewy skin. There are more shade variations available so it's easier to pick one that suits your skin tone. I find it goes on nicest with a combination of a flat foundation brush and/or a stippling brush. I get a really polished look to my skin wearing this foundation. You'll don't need a separate luminiser with this. Fast forward to where we are now. The new kid on the block, Chanel Perfection Lumière, is about to be launched. As I mentioned earlier, I've been using it for the last two weeks. I've tried to use it differently every time; with a sponge, with a dampened-down sponge, with a flat foundation brush, with my fingers, with a stippling brush. 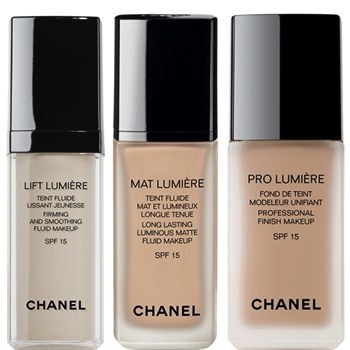 This foundation is replacing both the older Pro Lumière and Mat Lumière foundations (which will then be discontinued). It's not, as some people mistakenly think, an "upgrade" to Pro Lumière, it's a different finish altogether - this is a semi-matte foundation, not a dewy finish. Please click here for more detailed information on Perfection Lumière. TAKE CARE TO Work quickly, it sets quickly. DRY SKIN Vitalumière Aqua (older skins), Vitalumière (younger skins).